Though the EU has tried to place human rights and democracy at the heart of its external action, there are serious concerns about its capacity to have a significant impact on the situation of human rights and human rights defenders as well as on the democratization processes taking place in different regions of the world. 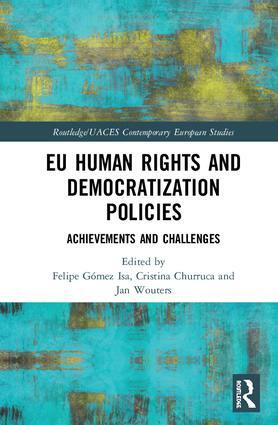 This edited volume sheds light on the achievements of EU policies and programmes in the field of human rights and democracy, also taking into account the challenges ahead. Analysing the changing global context’s effect on the ability of the EU to have a meaningful impact in the field of human rights and democratization, it examines relevant policies and programmes of the EU to see their impact on the ground. Combining various methodologies, the authors examine primary agreements and other EU documents, secondary sources (such as evaluations of EU’s policies and programmes) in the field of human rights and democracy promotion, and have interviewed EU officials, academics and other key stakeholders. From these, the book sheds light on specific programmes such as the EIDHR, the EOM and the EU Guidelines on Human Rights Defenders, illuminating the increasingly hostile environment to work for human rights and democracy in a number of countries. This text will be of key interest to scholars and students of EU human rights and law, to practitioners in Europe and beyond, and more broadly to EU studies, democracy studies and international relations.